To install a shower valve, you'll first need to remove the old valve (see replacing a shower valve). Next, make sure the copper is clean. 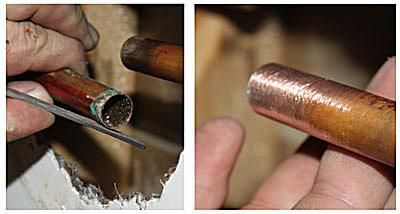 Sand off the copper pipes and ensure they are free of solder and burs. I had to cut the copper very close to the old valve so that the new valve would fit, and there was a lot of solder on the pipes. You can either file this off or heat up the copper and wipe off the blotches of solder with a dry rag when it runs. Be careful not to burn yourself when you do this and keep a spray bottle and fire extinguisher handy whenever you use the torch. Finish by sanding off any remaining solder and make sure it’s clean all the way around the pipes. Remove the plastic cartridge and any housing from the valve body before doing any soldering; the plastic components cannot stand up to the heat. Keep track of how the cartridge came out because you'll need to put it back in facing the same direction. 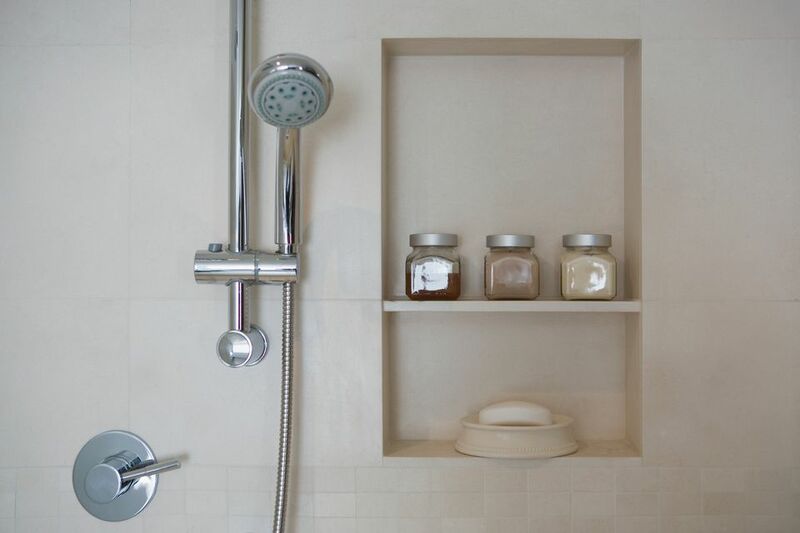 Before putting the shower valve in the wall, make any adjustments necessary. If the valve will go into a shower without an attached bathtub (like this example), the bottom of the valve needs to be capped. Make sure not to cap the wrong end. Position the valve so that the part that says "shower" or "up" is facing up. Follow the standard instructions for soldering copper and cap the bottom inlet of the valve. Let the valve cool before moving on to the next step. Apply flux to all of the valve connections and the pipe before putting the valve in the wall. Maneuver the valve into position. Sometimes it's difficult to get the valve into place in the wall because the space is tight, so do it only once, if possible. Also be careful not to drop the valve in the wall as you put it into place. Tip: Some people like to tie wire onto the valve so that if they do drop it, they can pull it back up. It is often easiest to put the valve onto the shower riser first and then the sides can pop into the sides of the valve. Be certain that the copper pipe pushes in all the way so that you can make a good joint. One method is to make a mark about an inch away from the end of each pipe since the fitting only pushes in about an inch. Be careful when soldering in small spaces to make sure nothing catches on fire; have the spray bottle of water and a fire extinguisher ready. It can also help to wet the wall a bit first with the spray bottle. Since these pipes are usually only half an inch, you don't need a big flame. Focus on one joint at a time and make sure the solder flows all the way around the joint, especially on the back side where it's hard to see. An inspection mirror will allow you to see if the solder flowed all the way; touch up an area if needed before turning on the water. Allow time for the pipes and the shower valve to cool after soldering before re-installing the shower cartridge. Reinstall the shower cartridge the same way as it was removed. Make sure that the shower valve is in the off position; then turn the water back on and check for leaks. Make sure there aren't any leaks in the shower riser as well. Lastly, install the trim and handle. Set the cover plate, then screw on cartridge sleeve. The handle goes on last and you are done!